Casting calls for newborn and family “models” for our photography workshops at CreativeLive are a regular part of my job as a line producer. In the 2 ½ years working at CL, I have probably “cast” over 70 newborns and kids to come into our studio and pose for our awesome photographers while they taught photography and posing techniques to the audience. I love seeing the families come in and I try to do everything to make their experience unforgettable, because from my perspective, it seems a great inconvenience to pack up a 7 day old newborn and go anywhere; especially to a live photo shoot in a bright room full of strangers. It always surprises me how grateful they are to come in, and I realize that what looks like a hassle to me is a really great opportunity for them to get some photos from world renowned photographers. When I became pregnant myself a little over a year ago, I have to admit I took a peek at the CL calendar to find out when the next baby workshop would be after my due date. As one of the non photographers working at CreativeLive, I figured I should take advantage of the talent just oozing out of our studios everyday. Fast forward 9 months later and Ezra was born. 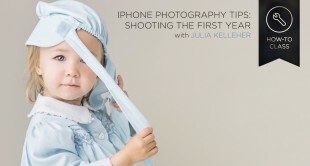 During my postpartum bliss, one of the producers at CreativeLive asked if I wouldn’t mind bringing him into the studio for Julia Kelleher’s next workshop: Family Photography: Capturing Connection. A chance to show off my perfect little bundle to the world and get some photos taken? Of course! Also, I had line produced Julia’s first workshop at CreativeLive so I knew it would be super fun to be on the other side of the camera. Ezra was one month old. 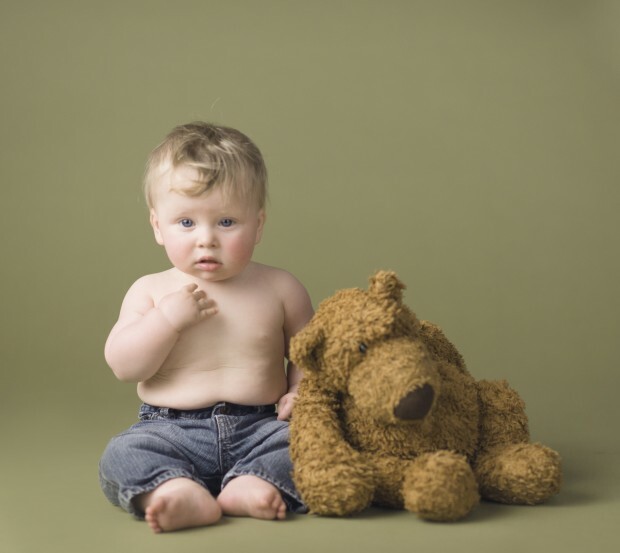 Julia is a true professional, and despite the fact that Ezra was “old” for a typical newborn photo shoot– she definitely connected with us and got some amazing shots! Rewatching the broadcast of this show brought tears to my eyes and made me remember how sensitive Ezra was to sounds, temperature, hunger, sleepiness- everything! Julia’s demeanor and expertise relaxed my husband and I, which in turn, relaxed Ezra. She even captured one of his first smiles. Timing was on our side because Julia, now a CreativeLive regular, was invited back a few months later to teach Baby Plans: Photographing the Early Years. She insisted having Ezra back in, as a repeat “model” because as she said, he was now part of a baby plan! I’m sure his charm and professionalism during his one month old shoot had something to do with it too. This time he was 6 months old. I am convinced he hammed it up so much for Julia that day because she had such a light casual air during the shoot. She laughed a lot and kept him engaged with her noises and hair flips! I just sat back and enjoyed the show. 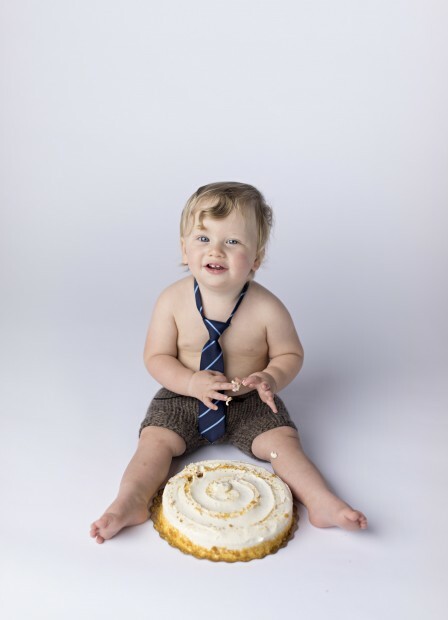 After a Photo Week class on iPhone Photography Tips, and a behind the scenes one year cake smash shoot, I had a well documented first year of Ezra’s life by the one and only Julia Kelleher! Lucky me! Of course I had documented Ezra’s first year on my iPhone. 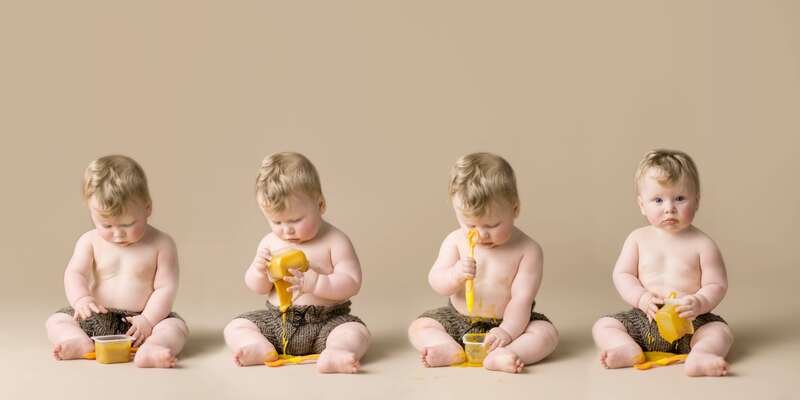 I had bath time shots, first foods, crawling videos– hundreds from that first year. I love them. But what I learned is that having those polished shots from Julia made all the difference when it came to prints. It’s easy to order some 4 X 6s of my iPhone shots from the store and send em off to Ezra’s grandma for a fridge display. But when I printed those pictures of my husband and myself standing against a flawless cream background holding a 4 week old Ezra, bundled tightly in our arms– now those were a quality gift for relatives. That shot was worth framing. And now, a month after his first birthday, I’m working on a photo wall along my staircase at home, with the first focus piece being a canvas print of Ezra’s 6 month old baby food picture, which I had no problem shelling out some bucks for. It was quality. I know that none of my iPhone candids were going to make it on my wall. My experience with Julia has proven what I have heard so many CreativeLive photographers stress to their students. Professional photography has enormous value. I have no doubt that seeing the prints of himself and his parents up on the wall of our home will be a constant reminder to Ezra of just how important he is. They’ll always make me remember the magic of this first year. Julia actually says it better on her website: “Let the beginning never end.” Thanks Julia, for making it look easy , and thanks to the professional photographers out there making sure we non-photographers have quality documentation of those precious memories. If you want to see more of how Julia made such an exhibitionist out of my son, she shares all her tips and tricks in the above CreativeLive classes, check em out! Lacee came to CreativeLive from the land of independent film in Seattle where she worked on over 30 short and feature length films. Her producing skills now help the creative geniuses at CL shine. And she still manages to get some snowboarding in every year.